No Palaeolithic flint was found but several sherds of Early Neolithic pottery, a piece of pitchstone and an axe flake were recovered, and these clearly show that the Neolithic material found in the main trench last year probably extends under the main road. A few pieces of chert including a microlith indicate that the Mesolithic material also extends beneath the road. 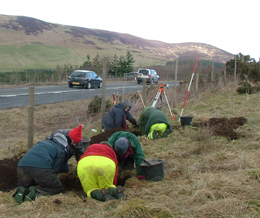 This will be the final fieldwork at Howburn, we now await with some excitement the results of the lithics expert and the work of the valley coring – watch this space. Fieldwalking continues each weekend but so far the results have been less than exciting. 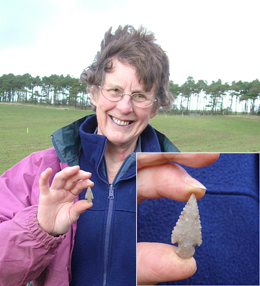 However, Joyce Durham was lucky to walk straight to this beautiful Barb and Tang flint arrow, found as a random find near Elsrickle. Although we are searching for concentrations of finds which will indicate a site, such objects make a days work worthwhile. Each year several such items are picked up adding to an ever increasing collection of flint and chert tools spanning all periods of Scottish pre history. Well done Joyce.